The zardosi work on the pink tussar was completed with further stone embellishments this week. I had bought a chanderi dupatta [long scarf]. 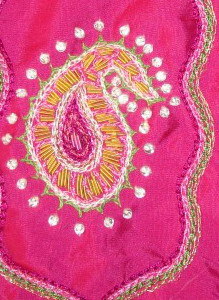 The scarf seemed to match with the pink tussar fabric, so a decision was made to incorporate a paisley and work the zardosi embroidery. After the completion of the embroidery, the scarf looks withdrawn from the tunic. The embroidery goes well with the tunic. So, the scarf is left hanging, literally. The tunic has gone to the tailor. 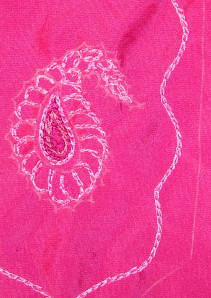 After returning from vacation, I have been designing yokes with the influence of Indian Gujarathi embroidery. This is the first piece. 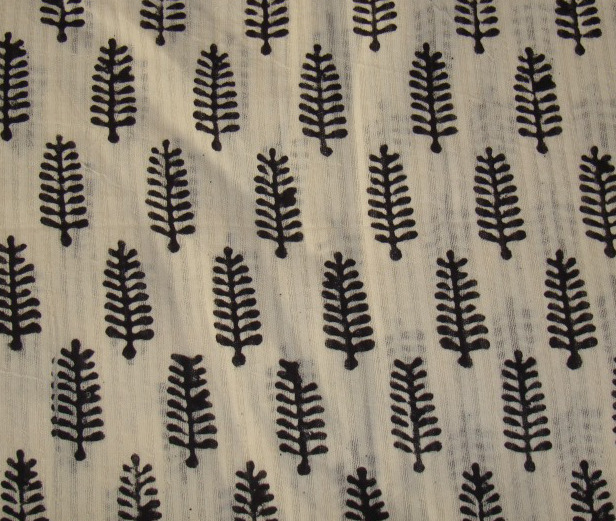 The fabric is block printed handloom cotton fabric in white. This has mirror work. Just started on the embroidery on this piece. The idea of working this yoke in contrasting bright colours is in mind. Result of seeing some bohemian décor on pinterest , I am sure! I am back on my routine. This week’s edges are simple to work with. Big borders are interesting, but with so many ideas for tunic projects, I prefer these simple borders. The free graph is here. This post was neglected for the past few weeks because of some intrusions. I am falling back to routine. 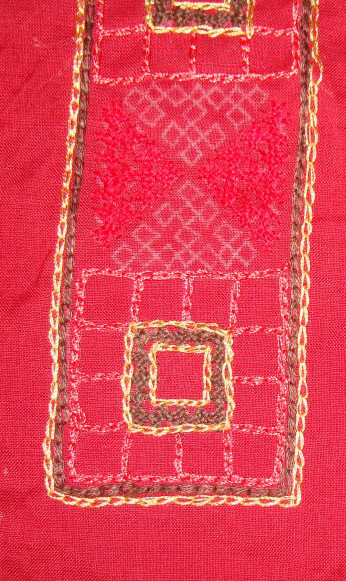 The work on red kutchwork yoke for brown linen tunic was completed. The yoke worked with beige colour thread. The completion of kutchwork and mirror work. This yoke is long and narrow. I was inspired by a pattern from an old book downloaded from the net. The pattern was drawn on a blue fabric. This was also completed this week. Should this post be- Work completed Wednesdays? 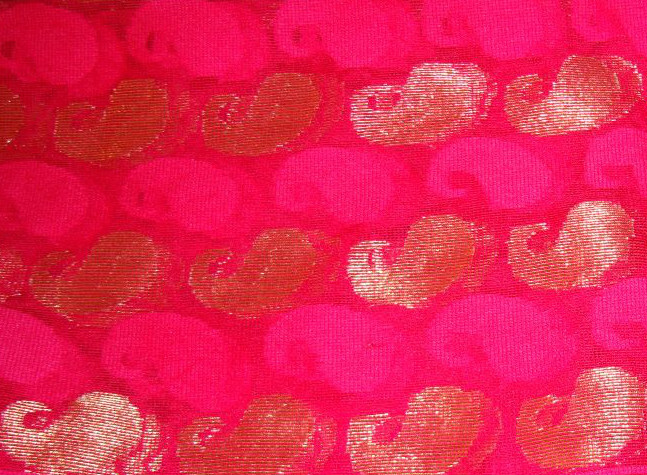 This design has two paisleys. I want to work the outlines with silk threads and incorporate them with zardosi tubes. Just started the outlining with pink threads. I was away for a week to Chennai, India. There was some problem to open my blog through internet explorer for the past three weeks. No stitching was done on this vacation. Last week was busy catching up on this challenge. The free graph for these edges are here. 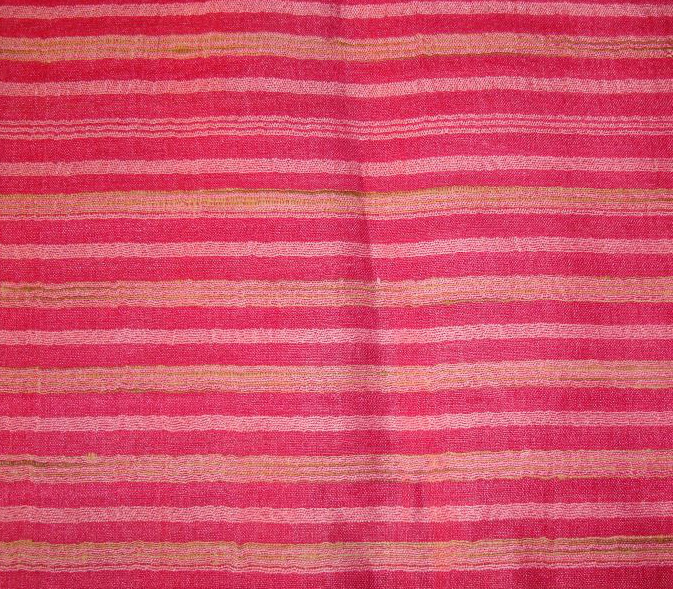 I am working this edges on handloom matti cloth, the width is not very long. With these two edges, the first piece was finished. The idea of making this piece into a drawstring bag is hovering in the mind. Another similar piece was prepared for next set of edges from the same cloth. This week’s edges were also simple. 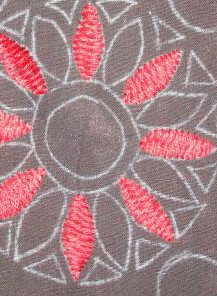 After catching up on these edges, did not have the mood to work the kutchwork edges based on these patterns. 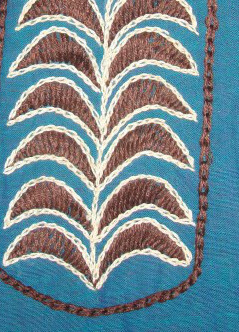 I have started designing yoke for tunics. More details on next post.